The United States has a complex national highway system that is roughly 160,000 miles long. For foreign visitors wishing to drive around, it is helpful to understand how the roads are named and numbered. You never know when this knowledge will come in handy. All major freeways that span across several states have one or two-digit numbers. Odd number means the freeway runs north-south, while even numbered freeways travel east and west. 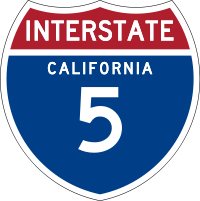 For example, interstate 5 (I-5) goes all the way from the Southern border in San Diego to the Northern border in Blaine, WA. I-10, on the other hand, connects the West Coast of San Diego and the East Coast of Jacksonville, FL. Odd freeway numbers start from the West Coast, and increase toward east. I-5 is the first major north/South freeway, and it sits right by the Pacific Ocean. The next one is I-15, then I-25, and all the way to I-95 which is located along the East Coast. Even freeway numbers start from south, and increase toward north. I-10 is the first interstate along the Southern border. Above I-10 is I-20, then I-30, and up until I-90. Three-digit highways connect to other major interstates. For example, 405 is a highway that is connected to I-5, while 215 is off I-15. If the first digit is an odd number, the highway is likely to have only one end connected to a major highway. For example, 710 is a "spur" route that leaves I-10 and goes into the city of Long Beach. If the first digit is an even number, the highway is usually connected to a major interstate at both ends. 405 splits from I-5 at one end (Lake Forest), but rejoins I-5 at the other end just north of Los Angeles. So they are often referred to as loops or "beltways." Other than the Interstate Highway System mentioned above, there is also a grid of U.S. highways, more often referred to as U.S. routes. Major U.S. routes are two-digit numbers. North-south routes are odd-numbered, and east-west even-numbered. However, what is different from the Interstate Highway System is that lowest odd numbers are in the east and highest numbers in the west. Similarly, the lowest even numbers are in the north and increase toward the south. For example, U.S. Route 1 runs north-south on the east coast, while Route 101 is located in California. Note that 101 is actually considered a two-digit highway. Three-digit U.S. routes are "spur" highways, but unlike the interstate system, they may or may not have direct connection to their parent routes. In general, U.S. routes are older roads and have largely been replaced by the newer and more functional Interstate Highway System. However, the grid of U.S. routes is still a major part of the country's transportation network, used by many local residents or as scenic drives. You may have noticed those mile markers along interstates. They can help you estimate how far you have traveled into a state and how far away you are from your destination. Mile markers always start at the state line in the south (for north-south highways), or in the west (for east-west highways). So if you enter Oregon from California, you will see mile 1 soon after you cross the state line, and then see increasing numbers as you travel north.